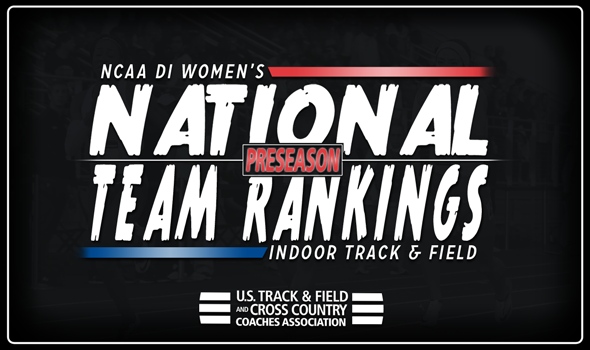 NEW ORLEANS –In the four years that the Oregon women’s indoor track & field squad has been ranked first in the U.S. Track & Field and Cross Country Coaches Association (USTFCCCA) Preseason National Team Computer Rankings since 2011, the Ducks hoisted the title at the end of the season. Memo to the rest of the country: beware. With heavy hitters Ariana Washington, Hannah Cunliffe, Katie Rainsberger and Alaysha Johnson – among others – returning to the squad, the Ducks open the season in the top spot of the rankings, announced on Wednesday by the USTFCCCA, and will look to capture its eighth title in nine years. Following closely behind Oregon are the Lady Razorbacks from Arkansas, which finished fifth a year ago after sitting second throughout a majority of the season. Arkansas will rely heavily on Lexi Jacobus in the pole vault and Taliyah Brooks in the pentathlon to see if they can once again disrupt Oregon’s dominance on the national level. Arkansas broke Oregon’s streak of five-straight titles in 2015 when the Lady Razorbacks took home the title. Three conferences – the SEC, Pac-12 and Big 12 – represent the three remaining teams in the top-five, with Georgia, Southern California and Texas rounding things out. The Bulldogs were runner-ups a year ago thanks to outstanding performances from Keturah Orji, Mady Fagan and Kate Hall, while the Trojans placed fourth with Kendall Ellis, Anna Cockrell, Dior Hall and Deanna Hill leading the way. The Longhorns made a huge jump from where they finished a year ago, as Texas placed 25th after a regular season that never saw them slip out of the top-10. With the likes of Teahna Daniels, Zola Golden, Kally Long and Rushelle Burton returning to the mix with transfer Pedrya Seymour joining the squad, the Longhorns should be major players this season. The remainder of the top-10 is flush with teams from the SEC, as Florida, LSU, Mississippi, Kentucky and Texas A&M own spots six through 10, respectively. Wisconsin sits just outside of the top-10 in 11th after finishing 41st at the indoor championships a season ago. The ranking marks the second time in three years that the Badgers are in the top-11 in the preseason poll, as they came in ninth prior to the 2016 campaign. Three other teams that found themselves amongst the best-of-the-best after finishing low in College State a season ago were Iowa State (14th), Villanova (24th) and New Mexico (25th). The Cyclones wrapped up the season in 47th last year after reaching as high as 18th in the rankings during the regular season. Villanova finished behind Iowa State in 56th, yet find themselves ranked as high as they’ve been since coming in at 22nd in 2012. New Mexico cracked the top-25 just once a season ago, and the Lobos have never seen themselves this high in the preseason poll. With distance runners Ednah Kurgat and Weini Kelati slated to have solid seasons, New Mexico is destined for its best season in years.